School days are supposed to be the best years of our lives however for some children it can be a horrific and daunting experience, what should be fun and learning can turn into an absolute nightmare for both the child concerned and the parents. Is your child displaying signs of anxiety at the thought of going to school, do they look withdrawn, worried or fearful or maybe they are refusing to go to school full stop. If this is the case then they might be experiencing school anxiety or school phobia and your child's well-being must be your first priority and school then becomes secondary. Any child can develop school anxiety at any age, often there is some form of trigger situation that has caused it such as being bullied, teased or generally feeling overwhelmed by this sudden transition in their life to either starting school for the very first time or changing from primary school to secondary school. If you suspect your child is experiencing school anxiety or they have school phobia then you need to take action immediately the sooner you nip it in the bud or you take appropriate measures to deal with it the better. How do I know this, well our child lost the last four years of schooling through developing school phobia after being bullied when he started secondary school. The worst thing you can possibly do is tell them things like don't be silly or even worse try and force them to go to school, just spare a thought to what your child is experiencing emotionally and physically, they have been thrust into an environment which they feel insecure and frightened. If they are being bullied there is little point in telling them to go and stand up for themselves and although it is important to teach them to be assertive when needed telling them to fight back when they are scared, the bully is a lot older or bigger or they are hopelessly out numbered is not going to help. Keep your child off school if need be until you sort the situation out, a young child should not have to live a life of fear. Seek help from your doctor and don't let the authorities bully you into making you make your child attend school especially in the most severest case of school phobia. If your child has school anxiety seek some help for it, if they have developed school phobia then the first thing you need to do is remove them from the school, perhaps there is another school near by, if they won't consider this you may find that in some area's there maybe specialist centers that cater for school phobia. Our child was put under the mental health organization, they could not find the solutions to help him. They are not suffering with mental health, it is a negative learned behaviour which with the right treatment can be overcome. If you cannot get your child back to school then you can put in for home tutoring or some parents prefer to teach their children themselves, remember the well-being of your child is the most important factor and it is not advisable to send them into the lions den each day if they have got school phobia. They can still attend school with school anxiety if it is not to severe as long as they are properly monitored and you treat their fears but once they have got to the stage of school phobia then they need help not shouting at. Sometimes children will try and refuse going to school out of naughtiness however in the case of school anxiety even though they may appear to be playing up and trying it on you have to consider that in genuine cases on the inside they could be living a life of torment and emotional hell, the child will be experiencing unpleasant feelings but they will have no idea what's going on and what's it all about. If your child looks scared, appears worried, anxious or they may even tremble then you need to give them the benefit of the doubt. Try sitting them down and talking to them, some may open up others may show signs of anger or frustration. When our child was first diagnosed with school phobia there was very little help available, luckily today there are some very good anxiety treatments available. Nearly all children could do with some confidence and self esteem building to help them through the early years and it would give them a solid platform for them to grow and develop for their adult years. The sooner you begin to help your child deal with their fears the better, and they could all benefit in learning techniques to help them beat their fears but if they have school anxiety then it is an absolute must you help them and give them all the support you can, listen to their worries and concerns and give them as much help as you can. 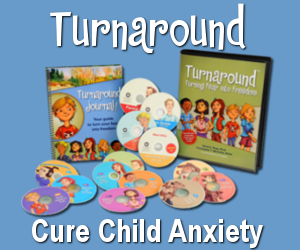 If your child is showing signs of anxiety or they are resisting going to school, they maybe tearful, ill or acting out of character, then Turnaround is a specially formed network and program that can help your children overcome their fears or anxiety. This program has been specially designed by professionals and is one of a very few programs that deals with child anxiety and school anxiety, it is well worth considering as your child's well-being is at stake.